Before he was the "Sage of Concord" and a driving force behind the Transcendental Movement of the 19th century, American poet and philosopher RALPH WALDO EMERSON (1803-1882) journeyed to England as a young man, the first of two trips to the Sceptred Isle. This delightful 1856 book is his examination of the British character gleaned from his travels in England, from the nature of their character to their love of humor, from their celebration of wealth and aristocracy to the grace of its religion. 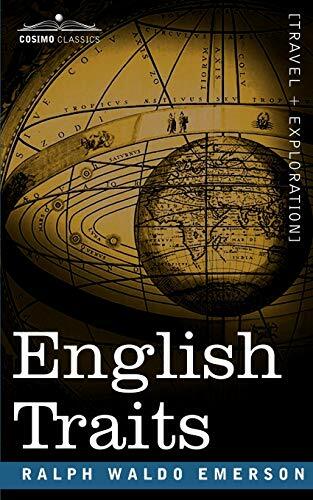 Not just an intriguing look at the people and places of Britain in the 19th century but an illuminating look inside the mind of a writer who remains a major figure in American literature, this is must-reading for fans of Emerson and of England. Ralph Waldo Emerson (1803-1882) was one of the most influential literary figures and the leading voice of intellectual culture in 19th century America. An essayist, philosopher, poet, and founder of the Transcendentalist Movement, his many now-iconic writings include Nature, The American Scholar, Self Reliance, The Over-soul, Society and Solitude, and Concord Hymn. Mentor to great writers such as Walt Whitman and Henry Thoreau, Emerson continues to exert a powerful influence on Western thought and literature.